Often we will recommend to customers who have a very specific product or service for one specific client base that they consider building a mini site. A mini site is a small one to three page website used to advertise a single product or service. The main benefit of having a small site like this is you can use it to target specifically certain keywords and search terms, allowing the site to get the best possible placement on search engines. 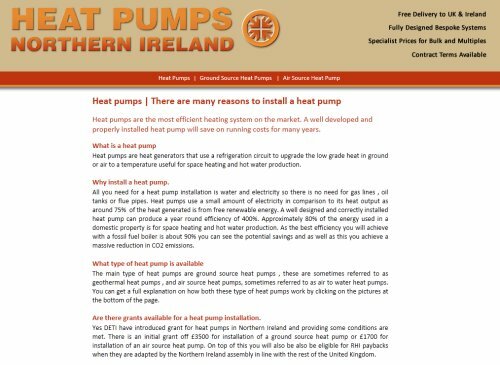 Heat Pumps Northern Ireland gives information to customers considering installing either a ground source or air source heat pump. Due to the specific nature of the site it means that users will quickly find what they are looking for and contact the client by email or telephone.